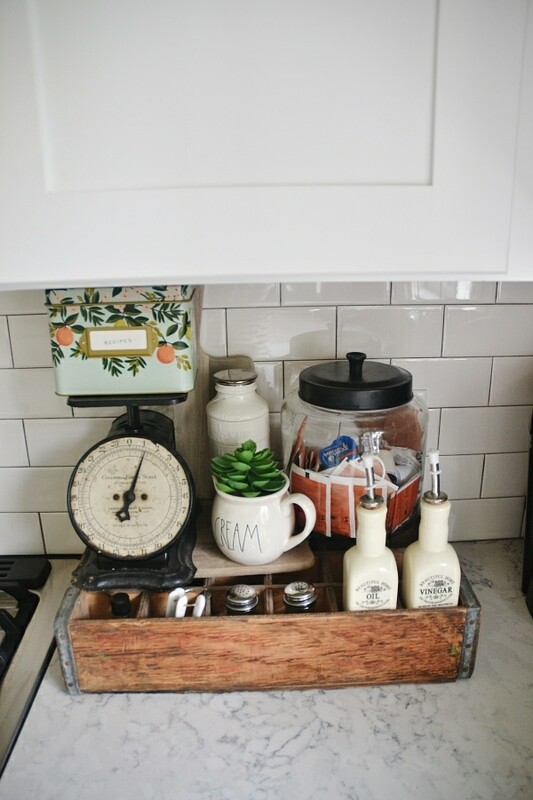 On the antique wooden crate I have an antique scale, a recipe box from Anthropologie [rifle paper co.] & two wooden cutting boards that help hold everything up on the crate that I believe are from Target. 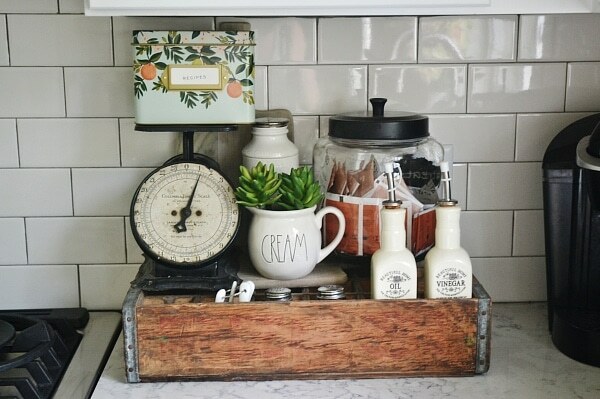 The canisters are a find from Marhalls along with creamer cup that I stick a faux succulent in when I’m not using it. Don’t ask. The glass canister is from Marshalls as well that I previously kept my tea & coffee together in. 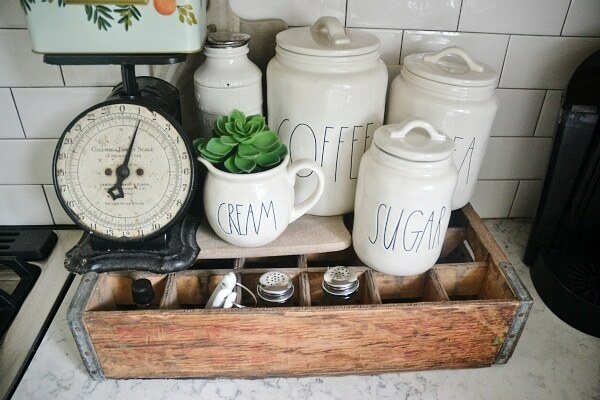 The measuring cups are a find at Anthro & in the little cubbies there is some shakers filled with yummies like cinnamon & cocoa, some measuring spoons from World Market, & some mini coffee syrups from Starbucks to garnish coffee with. 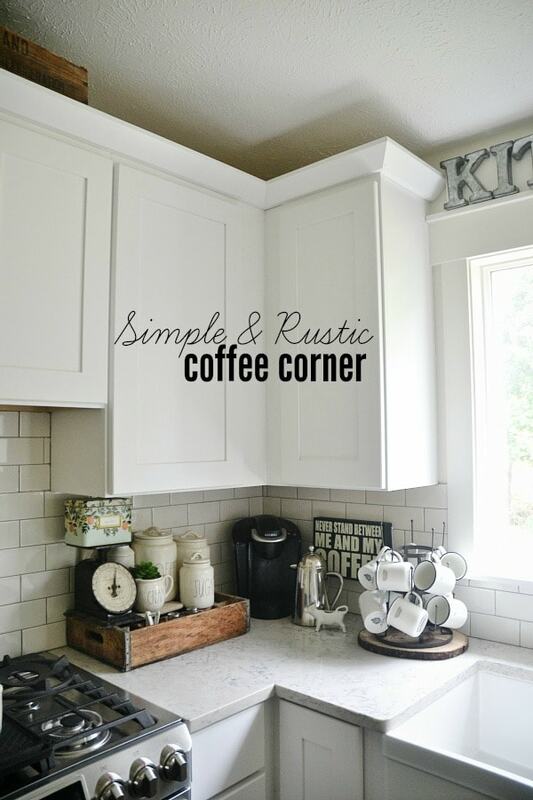 Just a quick rainy Sunday afternoon photo shoot of our little coffee corner in our kitchen. I love this little cozy space & it’s always changing so you know I’ll be updating you on the changes in the future. You can also follow this little corner on Instagram because I’m always sharing my coffee adventures on there under the hashtag #LMBlovesCoffee. Okay. Now here is the serious business… I’m not happy with our Keurig & I’m not always in the mood to make french press coffee. So, what is your FAVORITE coffee maker? 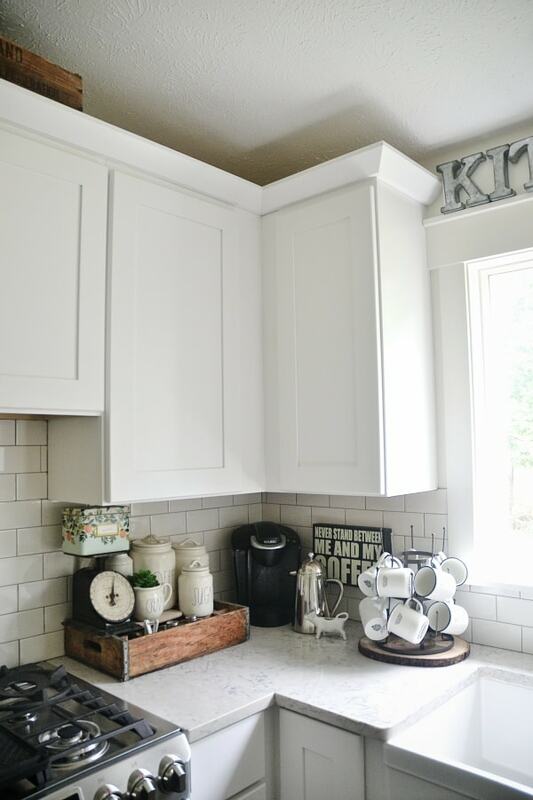 I’m ready to kick that single serve keurig to the curb & ready for something new so leave your suggestions & reviews in the comments below, find me on Facebook, & chat with me on Instagram. we have a Breville thr grinds and brews. It is kind or pricy, but it has a thermal carafe, and you have the option to brew a few different sizes of single cups or the 12 cup carafe. It also allows you to choose the strength of the brew. My only complaint is that the grinder is loud. 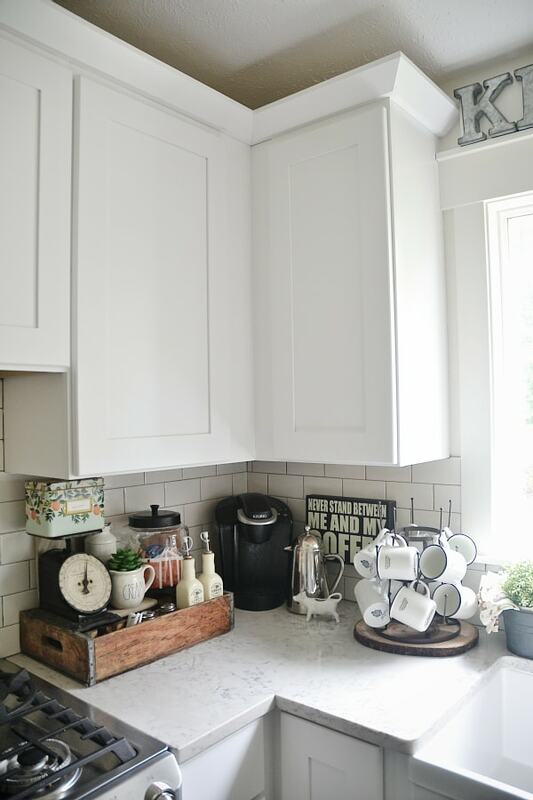 I love those canisters and how organize this kitchen station is. Wonderful! 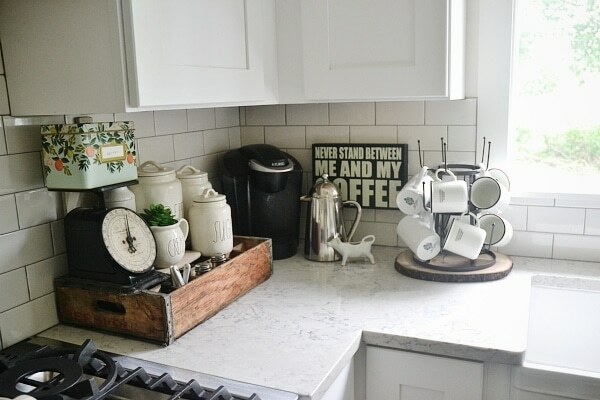 Coffee is very important for me and have to have special place in the kitchen. This is really lovely setting and I really like it. 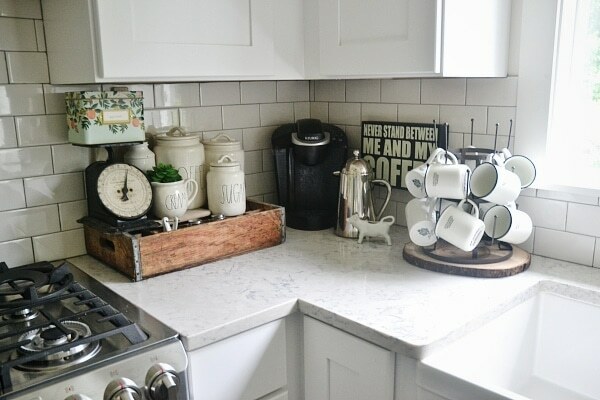 Love your coffee station! I just moved and I’m looking to do something similar in my new place. I have a Hamilton Beach Scoop coffee maker. It can make a 8 oz or 12 oz cup of coffee. It’s so simple to use! When I was little My great grandma would gives us coffee with lots of milk and sugar we felt so big and naughty so fun, In my family there’s always time for a chat and coffee with company and family! why are you getting rid of the Keurig? I love mine. love your little corner, not sure why it took 21 photos to show us though. it took the post forever to load with that many photos. A little something called an aeropress. It will give you the smoothest, best tasting coffee ever. It kind of looks like a french press, and only makes a single serving size, but it is SO WORTH IT! Sorry Liz, I Love my kerig but we upgraded to the newer one but I love your blog and you inspired me to get out of my workshop and start a blog, not as easy, I already had a different host and I’m still working on my store website, lol, but you are an inspiration and I come to your blog when Im in a funk. Such wisdom from such a young woman, you must have an old soul, thank you for just being you. We recently replaced our old coffee maker with a combo from Hamilton beach. It can brew a 12 cup pot as well as mane a single cup with either a k cup or a scoop of your own grounds. We love it! Favorite way to make coffee? Depends on the day! We have at least 4 different methods/machines because….never too much coffee, right? I am a big fan of the french press, but when I only want to make a single cup, I love our V60 dripper. Super easy to clean, fits over any coffee mug, and is fast for just one cup. You should definitely check it out! Thanks for sharing your little coffee corner today. i love your coffee station! my husband and I visit a different coffee shop every weekend. We love supporting small and local coffee shops. Whenever we are traveling, we like to visit as many coffee shops as we can (sometimes 3 in one day!). Needless to say, we are pretty obsessed. We recently invested in an espresso machine, the Rocket R58 and we love it! we use it everyday and we love trying different coffee beans. My favorites are Stumptown and Panthers coffee. I cant wait to see what new machine you get next. 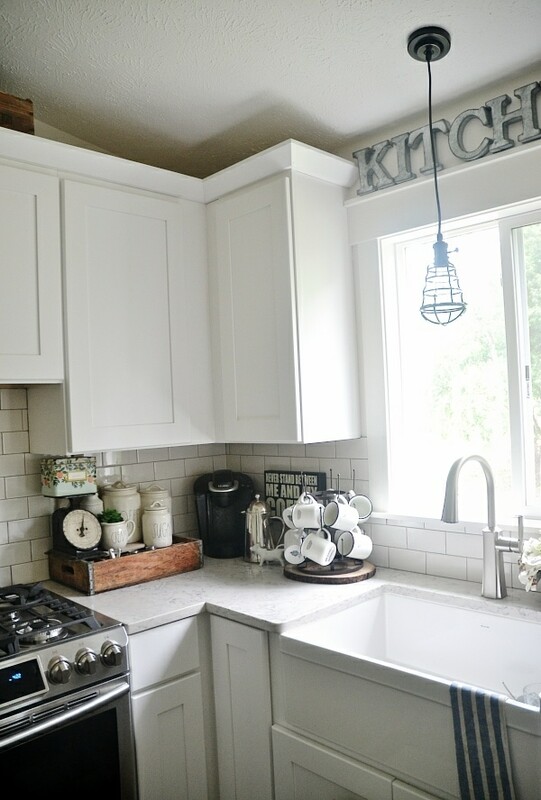 I have searched your blog and cannot find any info about your farmhouse sink, Would love to know the maker and where you found it. Many thanks! Hi! 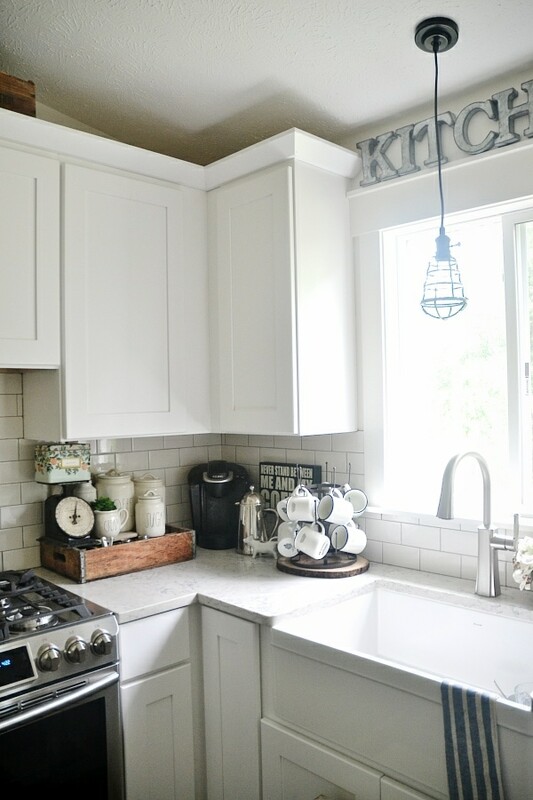 I’m pinning this little nook of yours for when I finish remodeling our kitchen this summer. We have a Bonavita. LOVE it! Brews quickly, perfect strength, and keeps the coffee hot until lunch (if it lasts that long)! Love your coffee corner and your endearing coffee tales. Over 2 decades we have owned a MrCoffee, a Krups and a Cuisanart. We ended up going back to a high end MrCoffee and start each day with freshly ground whole beans. 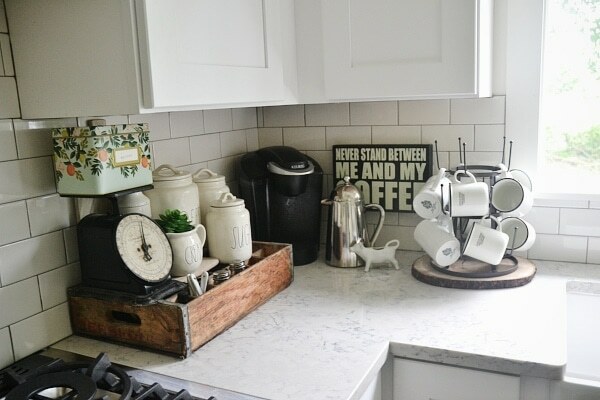 Love our MrCoffee carafe! also just purchased the new keurig for the versatility and options for the family throughout the day and we love it! I too just set up a coffee bar with both makers! So happy with them and the coffee bar! I love our electric percolator!! It makes great coffee & has sort of an old school feel to it, especially compared to a Keurig but I do have to say that it’s nothing compared to a French Press! I love both ways though! We got our percolator on Amazon from Farberware. BTW your blog is my favorite. It’s the only one I can follow because your style is just so in tune with mine & you’ve provided me with so much inspiration! Everything you do is functional and almost always affordable (Marshalls!!). Basically, to summarize, your blog is great and you are great. My husband and I just had to get a new coffee maker, and we ended up getting the Black & Decker Mill & Brew. We actually picked it out because it was on Cartwheel for 30% off at Target, and there weren’t any bad reviews online. It is programmable and will take both whole beans and ground in the reusable filter, which is nice; I would say though that it’s best to have a garbage disposal with this coffee maker because the easiest way to get the grounds out of the basket is to rinse it out in the sink. What makes the task even more difficult is that a majority of the ‘businesses’ out there are sheer scams designed to rip off gullible customers looking to make money online. The name crystal finds it origin in the Greek word krystallos. they will look unique and original. Dr. Marian Shaw is a graduate of Virginia-Maryland Regional College of Vet medicine, at Virginia Technology. all that Centerville Animal Medical facility needs to provide online. will certainly be returned when they are ready. Food Therapy is one of the main therapy techniques in Traditional Chinese Veterinary Medicine (TCVM). pet vet for 2 1/2 years in Manchester, England. Dominance Vet Healthcare facility aims to offer excellence in vet care to Chesapeake and surrounding areas. fatigue and also anxiety that everybody encounters. innovative optics for today’s precision shooter. This range additionally features a 30mm tube and also large 50mm unbiased lens for boosted light gathering for brighter photos at higher zooms. of the pressed or qualified breaches a particular obstacle. of which your specialist can offer base currency as a swap for quote currency. Thankfully, there exists a solution without having to be chained with a computer, to acquire your forex repair. Some forex dealers and instructors state that you are lulled by it right into a false impression of stability. the forex trading and keeping the profits arriving. where you could set up trading via the MT4 software, a different InterTrader Immediate bill. répondu à pas mal de questions.